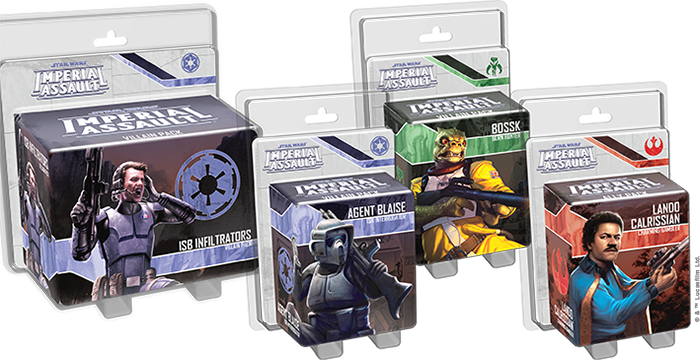 Fantasy Flight Games is proud to announce four new Ally Packs and Villain Packs for Imperial Assault! As we explored in its announcement article, The Bespin Gambit invites you and your fellow players to take part in a shadow war between Imperial agents and undercover Rebel operatives among the luxurious hotels and seedy underside of Cloud City. 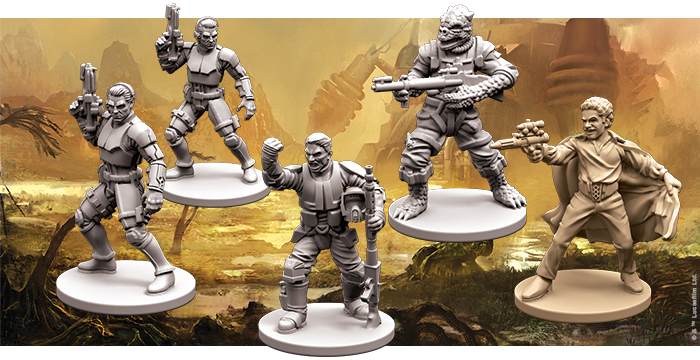 Outside of The Bespin Gambit, you can also take advantage of the four new figure packs whether you’re playing a new mini-campaign or preparing for a skirmish tournament at your local retailer. Powerful new figures join the Rebel Alliance, the Galactic Empire, and the Mercenaries of the galaxy with these Ally Packs and Villain Packs! 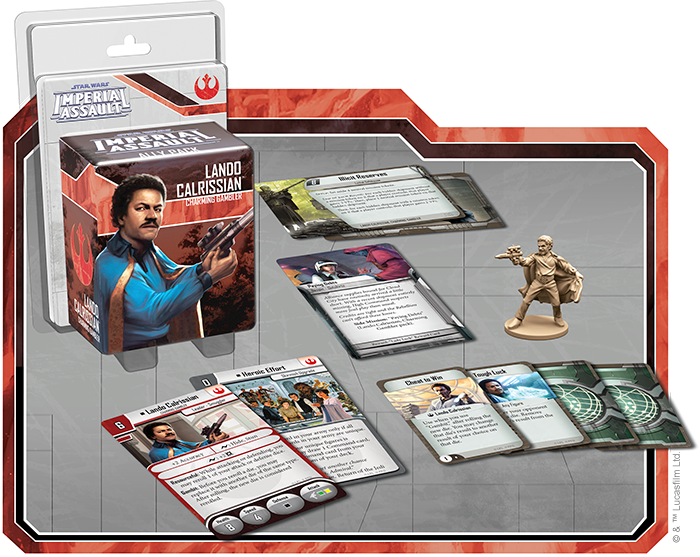 Each expansion offers detailed, sculpted plastic figures to replace the tokens included in The Bespin Gambit, and they also expand your games with new Agenda cards, Deployment cards, Command cards, and missions for campaigns and skirmishes. Across the galaxy, few Imperial institutions command more fear than the Imperial Security Bureau. Your neighbor or your family member may secretly serve the ISB. The man you pass on your way to work or the talkative woman in the cantina could be an informer. You can’t trust anyone, and in this atmosphere of stifling fear, few dare to speak of rebellion. 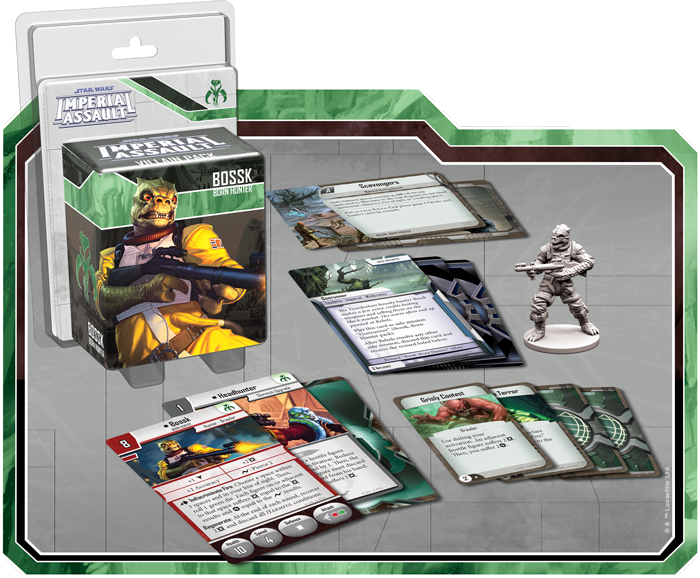 Now, you can enforce the status quo and punish sedition in your games of Imperial Assault with the help of the ISB Infiltrators Villain Pack. If the heroes are unlucky enough to encounter them on a mission, the ISB Infiltrators prove to be dangerous combatants, using the new Hidden condition to reduce enemy accuracy and gaining surges to deal more damage and increase accuracy. More than that, each ISB Infiltrator benefits from the Coordinated Raid ability, which allows another figure in the group to interrupt and perform an attack. Obviously, more attacks can significantly increase your damage output over the course of the game. Whether you’re using their unique talents in a campaign or a skirmish, this Villain Pack offers additional cards and missions to supplement your adventures in the Star Wars™ galaxy. A new Agenda set, Command cards, Reward cards, and a skirmish upgrade offer you additional tools for any mission, from the ISB’s vaunted training grounds to an Imperial facility on Bespin. ISB agents in Cloud City are led by none other than Agent Blaise, a methodical warrior and an expert interrogator. 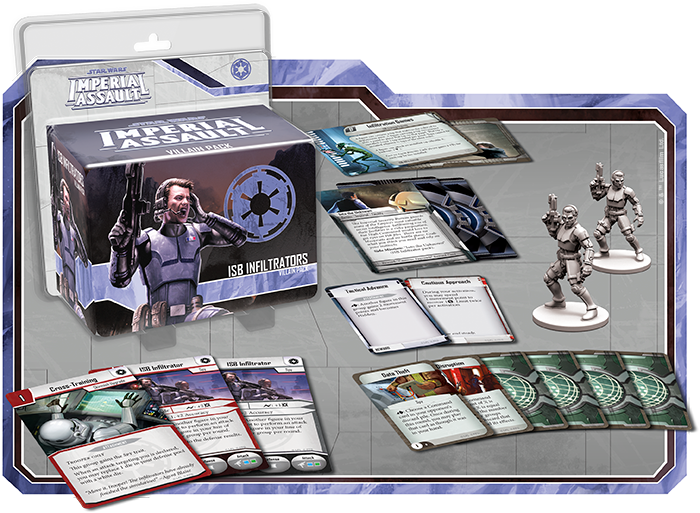 With the Agent Blaise Villain Pack, you can bring this Imperial warrior’s menace and precision into any game of Imperial Assault. Whether you’re stalking the halls of Cloud City or engaged in another campaign across the galaxy, Agent Blaise can be a menacing opponent for the Rebel heroes. 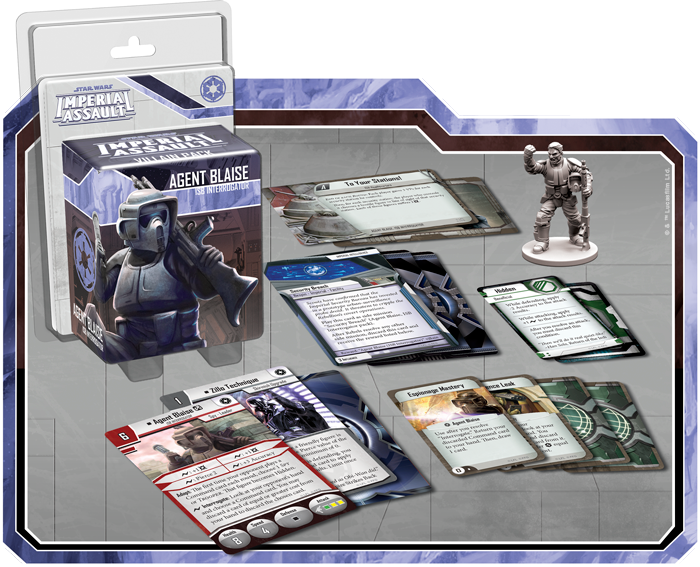 First, this figure pack contains a brand-new Agenda set, Imperial Intelligence. 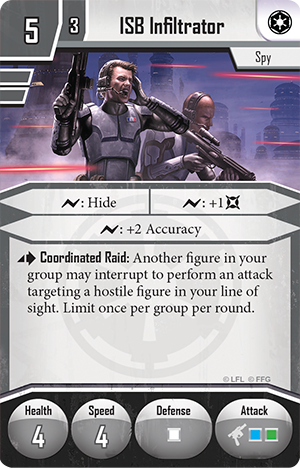 This Agenda set invites you to take advantage of your espionage and observation of the Rebel heroes—for instance, Under Surveillance allows you to record a hero’s favored attack methods and unleash your knowledge when the heroes least suspect it. You may also add Agent Blaise to your skirmish strike team to cut off support from the Rebel forces. 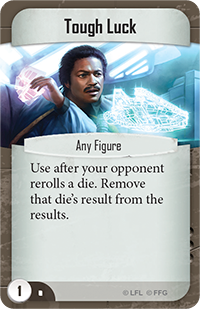 Two new skirmish missions bring you into the terrifying depths of ISB Headquarters, and new Command cards offer tricks and unexpected tactics for any strike team. 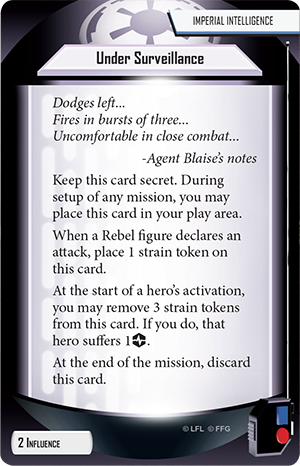 In addition to his reputation as a warrior, Agent Blaise offers several opportunities to interrogate your foes and discard their Command cards, ensuring that you always hold the upper hand. Finally, you can take up the hunt with Bossk, a deadly Trandoshan bounty hunter! Bossk was one of the bounty hunters searching for the Millennium Falcon in The Empire Strikes Back, and with this figure pack, you can harness his unbridled ferocity. Whether you’re taking contracts for the Mercenaries faction in a skirmish or working for the Imperial player in a campaign, Bossk will quickly prove himself a dangerous hunter. During your campaigns, the Bossk Villain Pack offers new challenges and thrills with an additional Agenda set to supplement your other cards. You can use these Agenda cards to brutally hunt down the Rebels or smuggle guns through the Toydarian wilderness, but no matter how you use them in the game, Bossk is sure to endanger the heroes with his wild attacks and regenerative talents. You may also include Bossk in your strike team for a skirmish game. Two new skirmish missions introduced in this figure pack challenge you to navigate the dangers of a Wasskah Hunting Ground, and an assortment of new Command cards introduce unexpected and unpredictable maneuvers. For instance, you may play Wild Attack when you declare an attack to immediately add one red die to your attack pool! 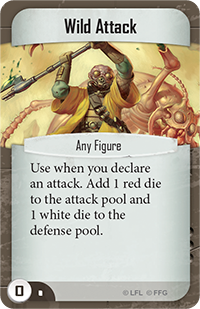 In exchange, however, you must add a white die to the defending figure’s dice pool. If you need to destroy a powerful figure in a single attack or suffer the consequences, Wild Attack might give you the edge you need.